It's the centerpiece of the winter season in Nice. The sun is getting higher in the sky, days are longer and spring is starting to seem like more than a distant dream. Nice Carnival is a yearly event that begins in February sometime before Fat Tuesday and ends sometime after. In between there are parades with floats and flowers, tons of free activities for kids and various neighbourhood events. For the most part though, Carnival in Nice is a spectator sport. It is not the custom for non-participants in the organised activities to don masks or costumes. The first historical mention of the Nice Carnival dates from 1294. Certainly Nice participated in European Carnival traditions throughout the Middle Ages when the celebrations preceding Ash Wednesday provided an opportunity for the oppressed peasant class to mock the aristocracy. The masks and disguises protected them from repercussions for what would ordinarily be a beheading offense. Naturally things eventually went too far and the Church cracked down, chasing Carnival celebrations indoors. Public celebration recommenced in 1830 to honour visiting nobility and continued as a yearly free-for-all where people pelted each other with flour and eggs. The modern form of the Nice Carnival dates from 1873 when the painter Alexis Mossa designed grotesque, outlandish characters and put them on floats. Although interrupted on several occasions by war, the Carnival has continued to this day. Each Carnival presents parades of floats centered upon a theme and the floats often, although not always, have gently political overtones. 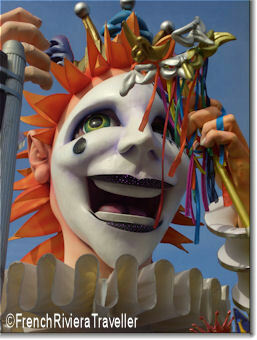 The parades take place on three or four afternoons or evenings a week during the Carnival period. Most parades are free. In addition to the floats there is also the "Bataille des Fleurs" in which floats resplendent in meticulously arranged flowers glide through the streets while young men and women toss flowers at the spectators. There is always an admission charge for the Bataille des Fleurs. The final weekend of the Carnival includes the "Bartenders Race" and, to cap off the festivities, the Carnival King is burned in the sea on the last night followed by fireworks. He'll be back next year! The parade route alters slightly every year but usually involves a parade partway up the Promenade des Anglais. For some parades and all the Bataille des Fleurs events, you need to buy a ticket. The most expensive tickets are in the tribunes lined up on the Promenade des Anglais and the cheapest just allow you to stand along the parade route. Tickets are on sale at the Nice Tourist Office or you can purchase them in stalls set up on the Promenade des Anglais.